Chelsea played host to Wolverhampton Wanderers at Stamford Bridge, as the Blues looked to put an end to their terrible run in from in the Premier League, having lost games to Arsenal and Liverpool, and were looking to try and find a return to form albeit against lesser opponents. However, given the fact that Wolves had been performing rather well, they were not going to be pushovers and Chelsea would have their work cut out for them in the game. 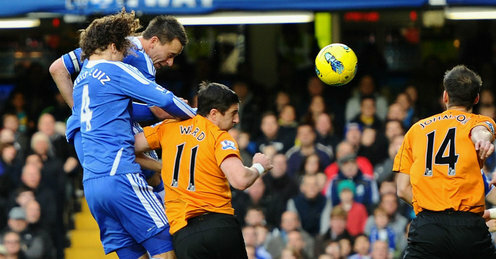 The Blues didn't look great from the off but it wasn't long before the ball was in the net, from John Terry. With two more goals scored in the first half, it was ultimately enough to secure a decent win and much needed three points. Wolves, who had won just one of their last 10 games before this, were there for the taking, and after a cagey opening five minutes, Chelsea took hold of the game thanks to Terry's opener. Ramires stole the ball off a dallying Nenad Milijas and fired goalwards only to see Hennessey tip the Brazilian's effort wide with a brilliant save. Stamford Bridge was sent into uproar from the resulting corner as Terry lost his marker to head Juan Mata's cross home from eight yards to give the Blues the lead. Despite taking the lead Chelsea, still lacked confidence and instead of pushing for an immediate second, they allowed Wolves time to settle. The midlanders lacked creativity, however, and their only real chance of the opening quarter came when Stephen Ward's header looped over the crossbar. The Blues were cautious in possession and appeared to lack the confidence to turn the screw on their opponents, but they suddenly sprung to life to double their lead in the 29th minute.Ronald Zubar attempted to bail Mata over, but the Spaniard kept his footing and sent over a low cross that Daniel Sturridge tapped home from close range after muscling past his marker. David Edwards headed wide from eight yards after Chelsea failed to clear a Wolves corner as the visitors looked for an immediate reply, but Mick McCarthy's vocal attempt to inject some life into his team failed. Instead, the Wolves boss looked to change things around with Milijas coming off for striker Sylvan Ebanks-Blake in the 38th minute. Hennessey was kept busy and spilled Sturridge's powerful shot over the bar just before the break. Then Mata made it 3-0 on the stroke of half-time when he was given room to beat Hennessey from 12 yards. Hennessey pulled off a top-drawer save to stop Ramires' powerful volley after the break as Chelsea looked to start the second half in the same way they had ended the first. Wolves looked a much more confident outfit in the second half, however, and almost pulled one back when Ebanks-Blake threaded Ward through, but the Irishman's shot trickled a couple of yards wide. Karl Henry's cross whistled just over the heads of a posse of Wolves attackers before Chelsea came close to adding a fourth on the counter. Sturridge slipped into the Wolves box after getting on the end of Ramires' pass and sneaked past Christophe Berra but saw his cross cleared by Johnson when he should have shot at Hennessey. Didier Drogba, who had been anonymous for most of the match, then hammered a powerful drive just wide while Hennessey was scrambling across his goal-line. Frank Lampard, dropped for Oriol Romeu, received a huge welcome when he came on in the 69th minute in the place of Raul Meireles. Hennessey then pulled off an excellent double save from point-blank range to deny Sturridge and then Mata. The home crowd demanded Fernando Torres' introduction, and Villas-Boas finally unleashed the former Liverpool man in the place of Drogba. The Spaniard darted in to the Wolves box, keen to make an impact, but his fierce shot was deflected wide. Torres once again stormed the Wolves penalty area but failed in his audacious attempt to lob Hennessey from 18 yards as the clock ticked towards 90 minutes. Wolves had one last push for a consolation, but Ebanks-Blake's weak injury-time header was the closest they came and the final whistle came, bringing a big smile to the face of Villas-Boas as he went down the tunnel.